Russia is planning to move missiles close to the border with Kazakhstan, ostensibly in preparation for instability coming from Afghanistan. But a number of analysts say that the move is instead a show of force occasioned by the crisis in Ukraine. The Russian newspaper Izvestia reported, citing Ministry of Defense officials, that Russia is planning to deploy Iskander-M theater ballistic missiles to the Orenburg region, about 100 kilometers from the border of Kazakhstan. The rockets would be ready to quickly be deployed into Kazakhstan under the auspices of the Collective Security Treaty Organization, and "would protect Russia and former Soviet republics from possible external threats from Central Asia," Izvestia wrote. Construction is underway to build facilities for the missiles at the Totskoye-2 military base and the missiles are supposed to be deployed by the end of the year. "Our government has said that the Central Asian vector is considered the most worrying, in connection with the reduced presence of the U.S. in Afghanistan. The exit of the Americans can lead to the destabilization of Kyrgyzstan and Uzbekistan," Vasiliy Kashin, a military analyst with the Center for Analysis of Strategies and Technologies told Izvestia. "In this case Russia's Central Military Region would need to be ready to move quickly to help Kazakhstan defense its borders. Kazakhstan's own forces are not very large." 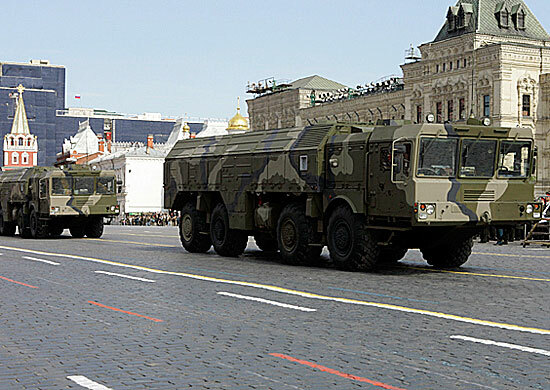 The Iskander-M is a successor to the Scud missile, and is intended for use against massed forces or stationary targets like airfields, air defense systems or groups of tanks. That wouldn't seem the most likely scenario for Islamists infiltrating Central Asia from Afghanistan, and not everyone in Kazakhstan is convinced of the Kremlin's intentions. "After the events in Crimea, the number of people who don't trust Russia's actions has grown," said nationalist activist Dos Koshim in an interview with Radio Azattyk. "So Kazakhstan needs to look as closely as possible at Russia's actions. The real aim of Russia's deployment of these rockets isn't clear. If these rockets had been deployed through joint efforts of international organizations or several countries, it would be reassuring. But it's difficult to believe that Russia decided on its own account to defend Kazakhstan. This is another attempt by Russia to establish an imperial policy." One wonders why, if the aim is to help protect Kazakhstan against instability from the south, that the rockets weren't deployed to Kazakhstan itself, rather than in Russia barely in range of Kazakhstan's southern border. (The same missiles have been deployed in Armenia, for example.) But Kazakhstan's government has been increasingly skeptical of the Russian military presence in the country. And the same day that Izvestia reported the Iskander-M deployment, Kazakhstan announced that it was suspending Russian missile testing in Kazakhstan after a meteorological rocket launched from Russia crashed in Kazakhstan. Kazakhstan's government has been trying to walk a diplomatic tightrope in the wake of Russia's takeover of Crimea; one suspects that behind the scenes that is weighing heavily in the decisions that Kazakhstan is making these days with respect to the Russian military on its soil. The Collective Security Treaty Organization (CSTO) does not intend to deploy the Iskander-M missile systems in Kazakhstan or other Central Asian states, CSTO Secretary General Nikolai Bordyuzha said in an interview with ITAR-TASS. “We don’t intend to deploy any Iskanders. Generally speaking, Iskander is not the kind of weapon to counter the challenges we currently expect from Afghanistan,” Bordyuzha stressed. Note the use of "intend."